Here is Part Two of Jaime Lee Newman and her pretty flowers! (If you missed it, here's Part One, where I got to take photos of Jaime Lee's pretty face.) Jaime Lee is the owner of Sweet Thorn Flora and designs thoughtful, stunning floral arrangements for weddings and other special events. She also graciously agreed to do an interview with me, where she shares about everything from what brings her inspiration, to advice for brides and grooms for their wedding day. 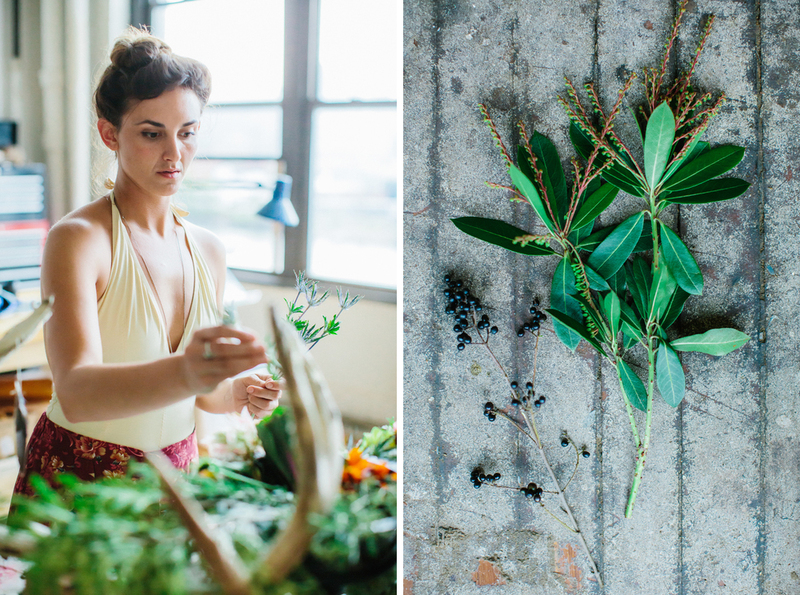 We've paired her interview with some beautiful photos we took at the Green Point Manufacturing and Design Center last summer, showing her process for arranging some flowers into a beautiful deer skull that her parents gifted her with. Enjoy! 1) What led you to floral design? I have always loved creating, and using my hands has been a constant in my life. Being from Iowa, I spent so much time growing up outside; playing, digging, exploring, camping, gardening and hunting. I went to school for fine art, and after college I became a wedding cake baker and decorator at a small French style bakery. We only used fresh flowers on the cakes, which was my first introduction to floral work and the backstage workings of weddings.Years later, I began working at a shop in the West Village that specializes in salt, chocolate, bitters and FLOWERS! I began making bouquets professionally and realized I could interpret what people were trying to emote through flowers. I loved creating the right arrangement to fit a certain mood, occasion or relationship. I then decided to try my hand at doing floral work on my own. 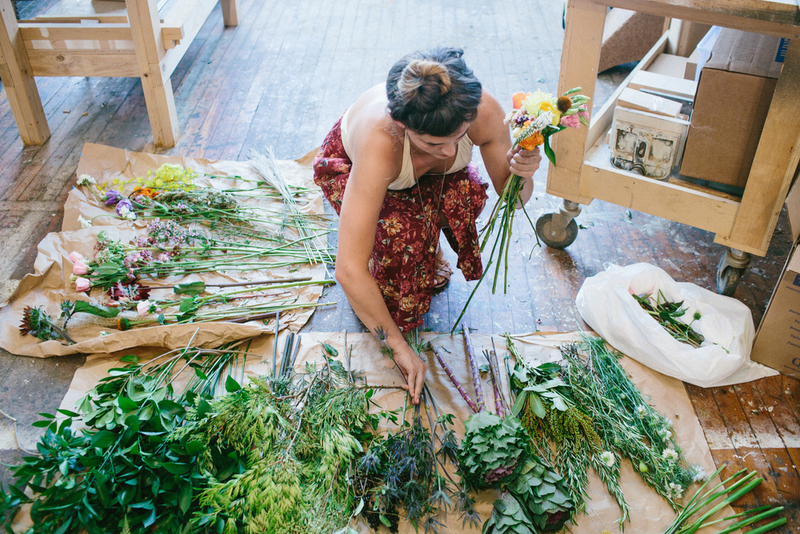 Working with flowers allows me to stay connected with nature while living in Brooklyn. 2) What do you love about floral design? I love that flowers are temporary, like everything, but bring so much beauty. I also love problem solving — only certain flowers are in season, people have budgets — and figuring out how to create something beautiful, even with limits. Everywhere! I volunteer at the Metropolitan Museum of Art and find inspiration in the art, paintings and drawings. Nature, in all its darkness and light. Skulls, feathers and other found fauna fascinate me. My bouquets are very lush, organic shapes with unique details and textural contrast. I’m most inspired by Dutch floral paintings; I aspire to create arrangements like living paintings, showcasing the textures and stunning colors that nature creates. 5) What are you favorite flowers for each season? Year round favorites - Garden roses, Thistle, Ranunculus, Scabiosa, and Waxflower! 6. What advice would you give brides/grooms? Learn the textures and color palettes you like most. Know that you can find flowers to fit your budget and you don’t have to use the most expensive flowers to have amazing arrangements. Be open minded — the more you know your taste, the more unique your wedding will be! Thank you so much for the interview, Jaime Lee! Don't forget to check out her site, Sweet Thorn Flora, to learn more.